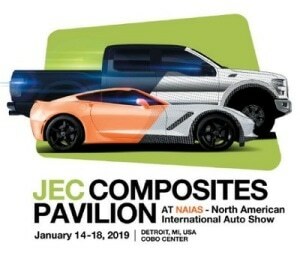 JEC Group, along with its partners MAGNA, the Michigan Economic Development Corporation (MEDC), IACMI – The Composites Institute and HEXCEL, will participate at the 31st edition of the North American International Auto Show (NAIAS) - a new pavilion dedicated to promoting composites solutions for mobility. JEC Group is the leading company dedicated to the development of information and business connections channels and platforms supporting the global growth and promotion of the composite materials industry. After a first pavilion at Mondial.Tech during the Paris Motor Show in 2018, JEC Group chooses the largest concentration of the world's top automotive and technology executives, designers, engineers and thought leaders to showcase the many benefits and advantages composite materials can bring to the future of mobility. For example, a glass fiber reinforced polymer bracket for wireless charging from Daimler will be displayed along with a door panel from HRC Group, a leaf spring suspension from Kolon, a tunnel reinforcement from Hexion and a lightweight liftgate from Magna to name a few.